A selection of 'g.org.e Truffles' delicious raw, free from chocolates in six gorgeous solid and soft centred flavours. 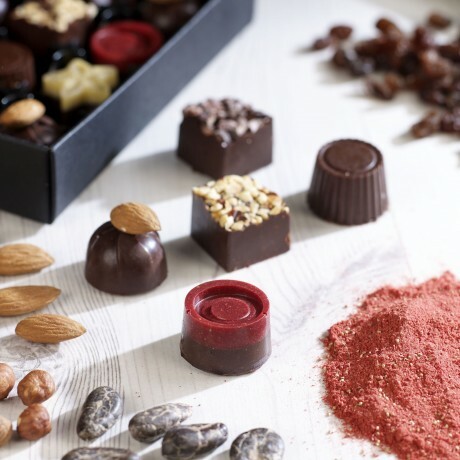 Rich, indulgent, and intensely chocolately, these organic, raw chocolates are perfect for Paleo or Primal diets, diabetics, coeliac’s and vegans/vegetarians. Most importantly, however, they are suitable for even the most dedicated chocoholic who wants an intense chocolate hit without any of the nasties. All g.org.e (Guilt-free Organic Eating Ltd) chocolates and truffles are made using only ingredients which are actively good for you. We select the finest organic and raw super-food ingredients bursting with vitamins, minerals and antioxidants, and add nothing else: no sugar substitutes, no emulsifiers, no preservatives - no nasties full stop. Now you can have a guilt-free g.org.e! These beautiful chocolates are presented in an elegant mat black box, with a gold glassine liner and hand tied with a gold organza ribbon. All of 'g.org.e Truffles' chocolates are freshly handmade in small batches. Shelf life: Best kept in a cool dry place and eaten within 6-8 weeks. Organic raw cacao butter, organic raw cacao liquor, organic almonds, organic dates, organic raw cacao powder, organic raisins, organic roast hazelnuts, organic raw cacao nibs, organic freeze dried strawberry powder, organic Madagascan vanilla powder, organic almond extract.